Bacon, Chicken and Green Beans has an almost-Asian flavor to it, which was a delightful surprise to my family who has been on the GAPS diet for about 2 years now. Since we don’t eat soy in any form, including soy sauce, we’ve been missing those Asian inspired dishes. This recipe uses bacon, and you’ll want to find a good source of bacon. We are pig farmers, and can tell our butcher that we want our bacon nitrate and sugar free. It will be difficult (if not impossible) to find a sugar-free bacon in a store, but you can probably find a good, thick sliced, nitrate-free bacon. For maximum nutrition, make sure to get your chicken from a farmer who allows the birds to roam on grass. Part of the reason we are all lacking in Vitamin D is because we do not eat animals that were raised in the sun. Find out what kind of feed the birds were supplemented with, as well. Feeds that are free of corn and soy are becoming more readily available these days, which is a good thing! If you have an estrogen-induced cancer, you’ll want to avoid soy-fed chicken, because the estrogen in the soy may cause your cancer to grow. Corn fattens the chicken very quickly, making for a profitable; but unhealthy product. Soy and corn were never meant to be food for poultry, as they must be processed by humans before they can be consumed. This time of year, I don’t think any of us have green beans growing fresh in the back yard. That is why this recipe calls for frozen green beans. There are many good sources of organic, good quality green beans. If you enjoy this dish, maybe next year you will want to set aside some of your own beans in the freezer so that you can make it again. Love this recipe? This is a guest post by Brenda of the Well-fed Homestead. Brenda and her family operate a small farmstead and she blogs about her experiences on the GAPS diet. While my family is away, celebrating the holidays with our favorite winter tradition – soaking in hot springs, Brenda offered to share her knowledge and her recipes with you. She’ll be answering questions about this recipe, so if you’ve got something to share, leave a comment for Brenda. If you have a guest post you’d like me to consider, please contact me. 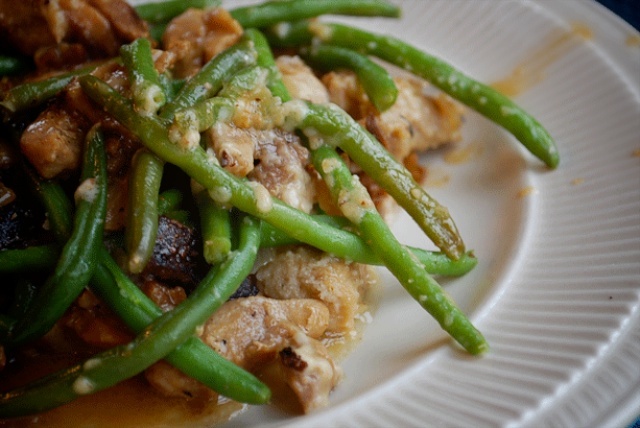 Easy supper with chicken and green beans. Heat a large skillet over medium high heat, cook bacon and set aside on paper towels. Cook chicken in remaining bacon grease. Add butter or ghee to the pan if there is not enough grease. Add garlic and onions and reduce heat to medium, stirring until the garlic and onions are tender. Add in green beans, and cooked bacon, cover and let simmer for about 5 minutes. Stir in cheese and coconut milk until mixed well. This recipe is delicious! It is almost curry like. In fact the next time I make it I may add some curry powder to it. The recipe seems good, except we don’t like dark meat chicken and avoid bacon at the moment. I am interested in making it in the future with chicken breast tenders when we go back to pork. People lack Vitamin D because they do not go outside much anymore. We used to spend hours a day outside. Now if people spend anytime they lather on toxic sunscreen and go out and still get cancer anyways. The best vitamin D is from the sun. Just get out in it! Just pray over the meat and it will be just fine. People worry too much. We can not all afford, nor do we all have the ability to get ahold of grass fed meats. If you can’t, just do what Jesus did and bless the food without any doubts in your mind, and it will be healthy. I agree that not all of us can afford to feed our families free range and 100% organic, but we can sure try our best! Now that I don’t order pizza delivery that gives me an extra $80 a month to put towards healthier foods! I am so excited to try this dish! Ummm…wow. I love the Lord but chose to co-labor with Him by taking personal responsibility for my health. Making wise choices and doing what’s best is His calling. When we pray for our food, we acknowledge He is the Creator and all things are under His charge – He makes clean the unclean – but the version of praying over our food as is listed in the above post is very much out of context. Scripture admonishes us in many places to be responsible. Although all things are allowed, not all are profitable. This recipe looks amazing – making it tonight! Wanted to comment that if you are really missing soy sauce for dishes to try coconut aminos, I actually like it better than soy sauce. Coconut aminos is so wonderful! Glad you mentioned it! Can’t do without it! I introduced it to my super-cook Asian friend- who is now hooked on it too! How would I adjust this recipe if I want to use fresh green beans. Love your site. So wonderful to know that the art of self reliance is not lost, and we don’t have to depend on the food industry for basics we use every day. Yous simply blanch the beans. Boil until bright green in colour, then drain and immediately place in iced water to stop the cooking. Keep dry until ready to put in a dish. Delicious. Wow! That looks like a really delicious recepy, will definately try it. Re the bit d thing, it’s not just one thing that causes deficiencies, but this bit of info might be of interest to any one trying to boost their levels naturally. They have just discovered that bit d is made on the surface of the skin in your natural oils, it takes about 48 hours to absorb in your blood stream. So, if you wash with soap on a daily basis, you literally wash it away. The advice was to only wash the really smelly bits with soap on a daily basis. Sorry just read my comment, am tapping in in my phone which is really slow, and has auto corrected vit d to bit d! + tons of spelling mistakes!! Just curious how this could be dairy free with the parmesan cheese? We are a dairy free family and I am always looking for delicious dairy free entrees. THanks! Just curious: can I substitute milk for the coconut milk. My family detests coconut (although I sneak coconut oil in whenever it’s undetectable). Is real cow’s milk or cream a sub for coconut milk or is there a better alternative? Made today. It’s pretty tasty, but I would highly recommend using fresh green beans. The frozen were not good texture-wise and had different flavor. Also, add sriracha if you have it! Yum. I made this tonight & thought it was FABULOUS. The only “extra” I added was a splash of wine at the very end before putting in the coconut milk & cheese. The flavor of the cheese & butter “masks” the coconut milk so you can’t even tell it was made with coconut. Fooled the husband! Haha. I did have to cool just a bit longer as all I has was bone in thighs.